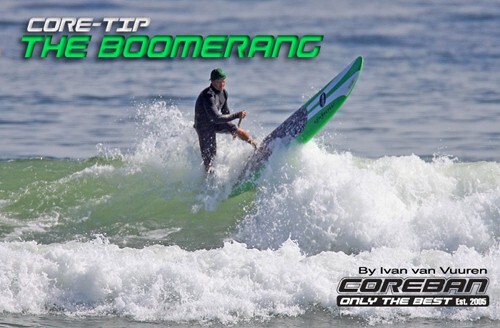 Ivan van Vuuren from Coreban takes us through a move called the boomerang, handy when you see a wave you just have to catch. So you’ve figured out how to get over waves without falling, it’s time to step it up a notch and practice the Boomerang. I’ve been doing them for about 3 years now and found it tricky at first but after a bit of practice it’s a great move that can be performed on waves 2ft or bigger and actually a great way to get on a wave face at the last second and ride the wave… Let’s take a closer look at some of the key points to successfully pulling off the move. First off we suggest initially trying on a small day just so you don’t end up losing all your front teeth first time round. Heading out to sea, as you see a wave approaching, begin increasing the speed of your stroke. Look for a wave that is breaking towards you and is not closing out- a softer, mushier type of wave will be easier at first. If you are goofy foot, initially look for a left breaking wave and if regular footed, a right breaking wave. As you improve either way can be an option. As you approach the wave, bear off at a slight angle, so that the bottom of your board connects with the wave at a side on angle. This will help push the board around and prevent it from being knocked out under you. Ensure that you are in a surf stance and apply extra pressure on your back foot almost sinking the tail as you distribute weight between front and back legs. As the wave begins to push your board around it’s important to keep your body low and weight over your board so as to absorb the shock. At this point, give a quick stroke with your paddle to assist in pulling the board around completely. Remember your paddle is a tool so use it to maintain balance and control. Speed is everything. So the faster you can stroke towards the oncoming wave, the more chance of pulling off the move. As you improve you’ll be able to do a full 180 and actually ride the wave so a great way to catch waves that come through the line up with no one on it. Practice makes perfect so go for it, watch out for other water users and have fun. WANTED – A cure for my hunchback lefts!